“Iran has made tremendous strides in eliminating gender gaps in education and health indicators. 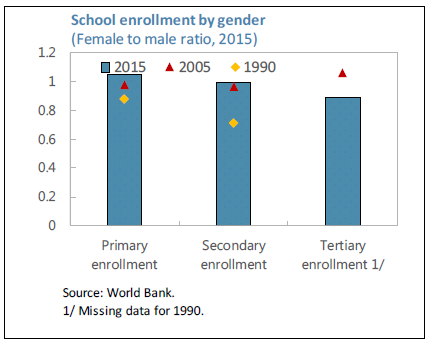 For about a decade now, there has been virtually no gap between male and female enrollment in primary and secondary education. The gender gap in tertiary education enrollment is small and, in some fields of studies such as engineering and science, women are now in the majority (IMF, 2016a). Years of schooling attained by women have expanded by 40 percent within in one generation (World Bank, 2016a) to reach an average of 9 years. The fertility rate in Iran has fallen sharply in the last 30 years and has been below two children per woman since the 2000s, and on par with the average of advanced economies. Life expectancy at birth for women is higher than men by 2 years (76.7 versus 74.5 years). Despite these laudable achievements, female participation in the labor force is low. 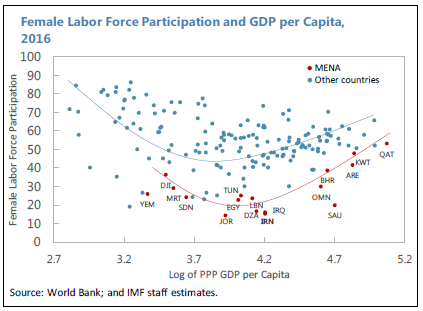 Female labor force participation (FLFP) was 16.2 percent in 2016, lower than countries with similar income per capita, including within the MENAP region. Some 83.8 percent of all females over the age of 10 are inactive and out of the labor force—the fourth highest rate in the world—3.2 percent of women were unemployed, and only 13 percent were working. Women represent 13.3 percent of legislators, senior officials and managers and hold 3.1 percent of seats in the parliament. Iran has two Vice Presidents who are women. Once in the labor force, women in Iran are also more likely to be unemployed. In 2016, the female unemployment rate of 18.9 percent was twice as high as males. 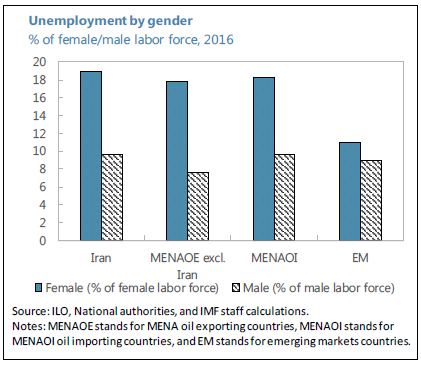 Although the average male and female unemployment rates are broadly in line with the MENAP region average, the female unemployment rate exceeds the emerging market average (EM) of 11 percent. Furthermore, a woman in Iran is likely to remain unemployed longer. While 30 percent of men remain unemployed for less than 3 months (versus only 11 percent of women), almost 48 percent of women remain unemployed for more than 19 months (versus only 28 percent of men).